The sarangi is a bowed instrument, among the few of its kind in the repertoire of Indian classical music. 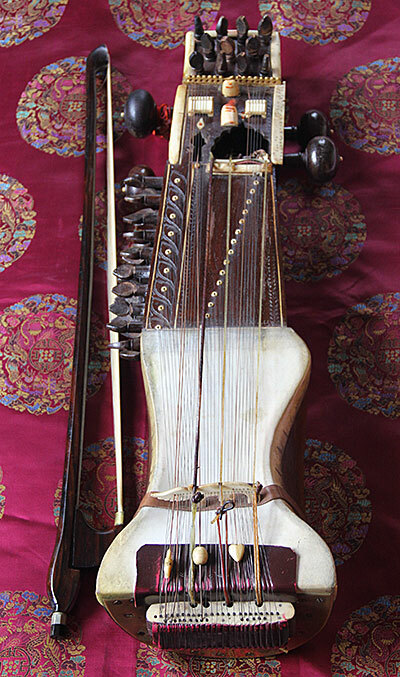 Like most string instruments the Sarangi has a wooden sound box. Its fingerboard is without frets and the ivory bridge over and through which the strings pass is firmly placed upon leather parchment that is stretched across the bottom half of the sound box. The Sarangi has three main playing strings made of gut and thirty six resonating (or sympathetic) metal strings which are tuned to the notes of the particular raga being played. The left hand technique is particularly interesting in that rather than stopping the strings with the fingers as with the violin, the finger nails are used which allows for the subtle glides and embellishments so characteristic of Hindustani music. Although an ancient instrument and one whose tone has remarkable range and sensitivity as well as close proximity to the human voice, the Sarangi had maintained a secondary role as that of an accompanying instrument in vocal concerts. That status has changed forever due to the almost singlehanded efforts of Harsh’s grandfather, Pandit Ram Narayan, over the second half of the last century. The Sarangi now stands firmly on its own as a modern Hindustani classical instrument.